Everyone always says they want to “get away from it all,” but where exactly do you go to do that? One look at the peaceful waters of the lake while you sip your morning coffee or tea will be all the convincing you need that you made the right choice by coming to Melgeorge’s. 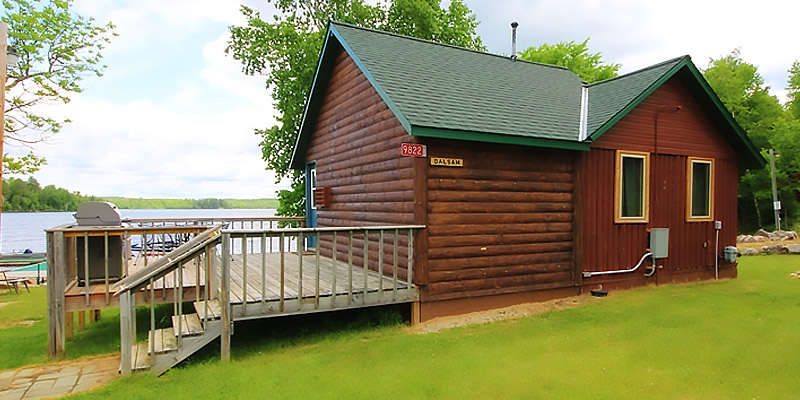 We have many cabins to choose from, as well as comfortable rooms in our lodge. Our restaurant and bar is available to all guests and offers an exceptional traditional north woods menu for breakfast, lunch and diner. Stunning lakeshore cabins that are the ideal place to leave the stress of everyday life behind you. Fully air conditioned to help you cool off after an adventurous day outdoors, these cabins come with all the modern amenities. These are great options for larger families and groups looking to share the joys of escaping from the confines of everyday life. Stay in our authentic log cabin, or kick your feet up in one of our many other fantastic spots, all just a short walk to the lake. Comfortable rooms that feel like your own cozy bedroom will ensure that you get the rest and relaxation you’re in search of, especially after a fun day filled with lake exploration, fishing, hiking, or any of the other various activities our guests enjoy. The restaurant and bar is just downstairs and is a great place to meet up with new friends and enjoy incredible lake views.